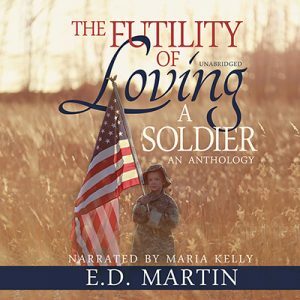 Let’s continue with the five-part story I’ve been posting from this month, “A Family Tradition,” in my short story collection, The Futility of Loving a Soldier. Background: Joos, who served in WWI (and whose story is told in the first part of “A Family Tradition”), is estranged from his son Maarten, a man who served during WWII and has spent his life battling his father’s legacy, as conveyed by his single mother, Ophélie. Joos has shown up at Maarten’s house, but Maarten isn’t sure if he’s ready to reconcile. Who was Joos, really? Nothing but an old soldier making up excuses for missed chances and regretted choices. Maarten brushed aside the similarities crowding his mind, focusing instead on the picture his mother had always painted. He would never be like Joos. He stared at his father, his face hardening. How dare this man come here now, thinking they were anything alike! 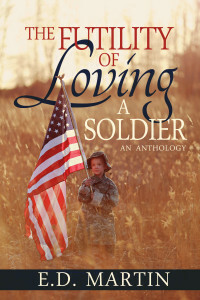 Today is Father’s Day, and what better way to celebrate than to continue with the five-part story I’ve been posting from this month, “A Family Tradition,” in my short story collection, The Futility of Loving a Soldier. “She never forgave you.” Even on her deathbed, Ophélie had cursed Joos. 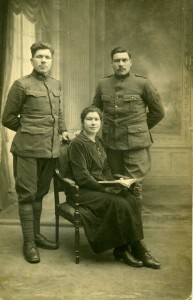 My great-grandfather in his WWI uniform (left) with his brother and sister. Will Maarten forgive him? And how will this decision affect Maarten’s relationship with his own sons? 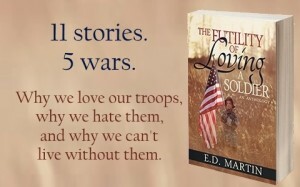 Get a copy of The Futility of Loving a Soldier to find out! In this excerpt, continuing from last week’s, he’s just arrived home from a Scouting trip with his sons, to find a strange car in the driveway. Once inside, he comes face-to-face with his father, whom he hasn’t had any contact with in over thirty years – although his father claims to have written to him on a regular basis. Was Joos really as bad as his mother had led Maarten to believe? He knew all about his temper and his cowardice in the First World War. Maarten hadn’t been a coward. 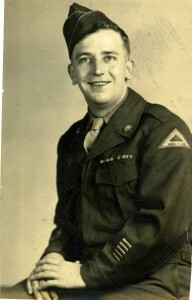 He’d enlisted right after Pearl Harbor had been hit and had tried his best to serve, but he’d been sent to Algeria, not France or Italy, to work on trucks instead of shooting Krauts. He’d tried a second time, but Catherine’s cajoling had kept him out of Korea. Now he was raising his own sons to be soldiers, to be tough, to be heroes—the opposite of that man in the living room. Read more about Maarten’s and Joos’s struggles by picking up a copy of The Futility of Loving a Soldier, then post a link to your eight sentences blog entry, or join the fun at the Weekend Writing Warriors website. For May I’m pulling from my short story collection, The Futility of Loving a Soldier. In this excerpt, continuing from last week’s, he’s just arrived home from a Scouting trip with his sons, to find a strange car in the driveway. Once inside, he comes face-to-face with his father, whom he hasn’t had any contact with in over thirty years. “I was passing through town, and I thought I’d stop…” he started, but his voice trailed off under Maarten’s withering stare. “I sent them.” Joos’s jaw clenched and Maarten’s thoughts turned to the one picture he had of his father, taken on his parents’ wedding day, where Joos’s fist was clenched in the picture, a sign of his anger, as Ophélie had often pointed out, and his quick temper; if she’d known he was a fighter, a liar only after her for the money he thought she had, she’d told her son again and again over the years, she never would’ve married him. Read more about Maarten’s and his son Artie’s struggles by picking up a copy of The Futility of Loving a Soldier, then post a link to your eight sentences blog entry, or join the fun at the Weekend Writing Warriors website. Today’s excerpt comes from the second of five related stories, “A Family Tradition.” This one is about Maarten, a man who served during WWII and has spent his life battling his father’s legacy, as conveyed by his single mother, Ophélie. In this excerpt, continuing from last week’s, he’s just arrived home from a Scouting trip with his sons, to find a strange car in the driveway. They go inside to find out who the visitor is. “They’re wonderful,” said a male voice that tickled at the edge of Maarten’s memories. He followed his sons into the living room but froze on the threshold. 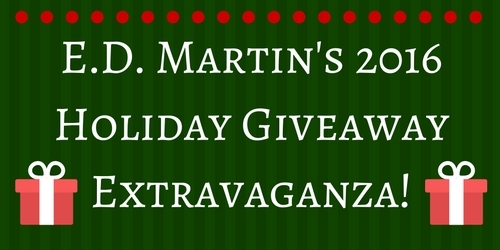 A man roughly his height stood as he entered, hands twisting the army hat he held. He had the same nose and dark hair as Maarten, and the same way of standing and of cocking his head slightly to look at someone when sizing them up. “Hello, Maarten,” said the man. “I know who this is.” Maarten took a small step forward, willing his voice and heart to calm. Read more about Maarten’s and his son Artie’s struggles by picking up a copy of The Futility of Loving a Soldier.